After a weekend of little success on Conewego, the Falling Spring and Mountain Creek, Ron Hill (brother-in-law and fishing buddy) and I decided to drive to Huntingdon, Pa to catch the Grannom Caddis hatch. Our first stop was Topp’s Diner for breakfast and our second stop was Spruce Creek Outfitters (www.sprucecreekoutfitters.org) to get some input from Allan Bright (owner) who is always helpful. Allan used to stay with another old fishing buddy’s house (Levi Keefer) near my home in Fayetteville to fish the Falling Spring. The word from Allan was that the Grannom’s had come and gone in the stretch of water near his shop so we decided to drive upriver to the Vietnam bridge…above the bridge where the Little J crosses rt. 453. Fortunately, the Grannoms were on! There was a 20 minute window when the fish were in a feeding frenzy, but after that, even though the hatch remained consistently good, rises were sporadic. During the frenzy, we hooked up with a few fish, but for the life of me, it surprises me why the trout would even take an imitation with so many live caddis dancing on the water. We stuck it out until mid afternoon hoping for another frenzy, which never came…..and with only a handful of catches and misses, one catch made it all worth it. 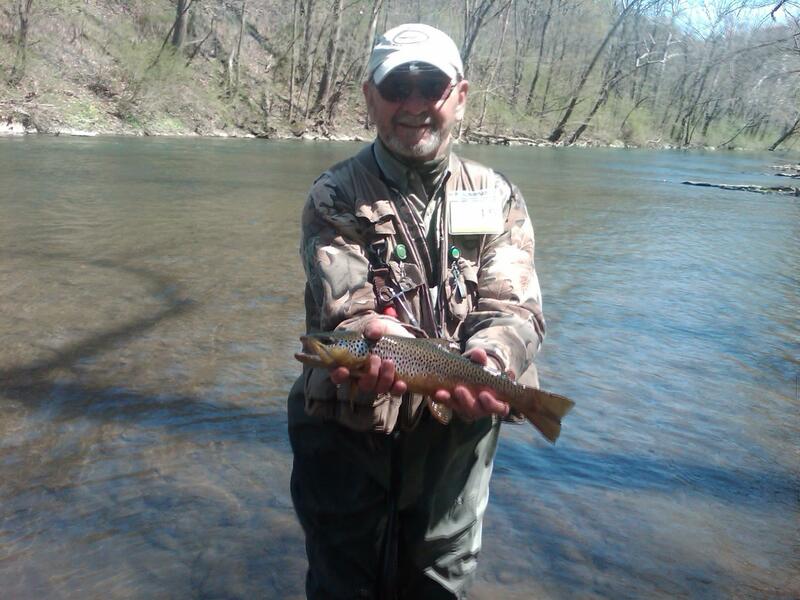 Ron made a great cast above an overhanging branch across a hard riffle allowing his Grannom to drift into the softer water on the far side of the riffle and hooked up with an 18″ Brown. Watching this beauty rise to Ron’s fly even had my heart pumping. The Grannoms only last about a week on the Little J during the month of April. If you have the time, go to the stretch near Birmingham along rt. 453, within the next day or two. Or, put it on your calendar for next year. You won’t regret it!